Welcome to Pack 1385's new Scoutlander Website - for improved communication and improved Cub Scouting! 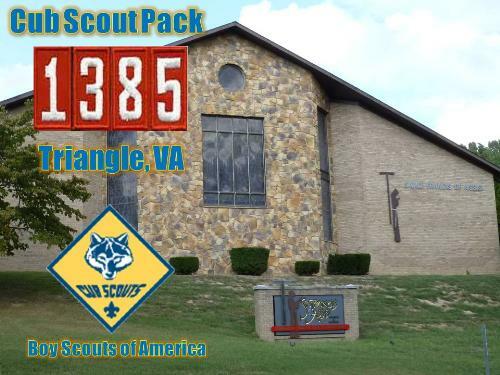 Pack 1385's School year program has begun and we have another awesome 2015-2016 school year planned! Our "Fall Join Scouting Night" Pack meeting that kicked off on the 23rd of September, and we had an awesome Halloween themed family campout at Camp Snyder in Haymarket on the 24-25th of October weekend. Check out the attached flyer for details about our Pack, and try to join us at our next Pack event, OR don't wait! Contact us right away and get connected with a Den in your age group, who meet in between Pack meetings . If you have an interest in joining Pack 1385 please contact us at the above "Contact Our Pack" link and also check out the "Join Cub Scouting" link for additional information on the joining process. 12th: Webelos Crossing Over ceremony - the Cobra Den become Boy Scouts! 24th: Pack Meeting/Spring Join Scouting Night (kindergarten students about to graduate into 1st grade can join)! In July of 2015, National BSA headquarters and related BSA governing bodies have resolved to allow Homosexual Leaders in the Boy Scout program. The ruling, however, allows and supports religious organizations that charter Scout units to establish their own membership policies with regard to this issue so as not to violate their religious beliefs. ALL Catholic sponsored Scout units in the Diocese of Arlington - as directed by the Bishop - must have their direct contact leaders (leaders who are in direct contact with youth) agree in writing that they will comply with Catholic Canon Law with respect to homosexuality and the Scout program. As a general rule, all matters of sexuality - of any variety - are considered by Pack 1385 to be personal and sacramental family matters which are not appropriate to be discussed or displayed in the Scouting venue - without exception. Please see the message below from Father Kevin, pastor of St. Francis of Assisi Church, for further Catholic guidance on this matter as it will be applied within the Parish of St. Francis. On May 23, 2013 the National Council of Boy Scouts of America’s approved a resolution stating that “No youth may be denied membership in the Boy Scouts of America on the basis of sexual orientation or preference alone.” In light of this decision by the Boy Scouts to end their ban on openly gay youth from participating in its activities some people in the parish have asked me if this decision by the Scouts will affect our sponsorship of the Girl and Boy Scout Troops we have in the parish. My answer is absolutely not!! To my way of thinking why should this decision affect our support of scouting? The Catechism of the Catholic Church makes it very clear in paragraph 2358 that “the number of men and women who have deep-seated homosexual tendencies is not negligible. They must be accepted with respect, compassion, and sensitivity.. Every sign of unjust discrimination in their regard should be avoided. These persons are called to fulfill God's will in their lives and, if they are Christians, to unite to the sacrifice of the Lord's Cross the difficulties they may encounter from their condition.” In my opinion we would be discriminating if we did not allow young people who are homosexual to be a Scout and that would be wrong according to our Catholic Catechism. When I was young (a long time ago) I was a boy scout and it had a positive effect on my life. It provided me with great values, an appreciation for this great country we live in, and a love for the outdoors and camping. I would hate to see any young person being denied what scouting has to offer just because of their sexual orientation which they have no control over. To discriminate is wrong and it will not be tolerated here at St. Francis.